As you read this, we will be in the very middle of our brief arctic summer. It’s a time when many of our listeners travel to even more remote points than their home villages to gather food for the coming winter. Please pray for everyone’s safety, won’t you? Thank you so much for your generous help, which provides many of these people their only contact with the outside world this time of year, and does so 24 hours a day. “WEATHER” OR NOT: (left) Long time Nome resident John Johnson prepares to voice an educational spot on meteorology while volunteer production director Liz Recchia looks on. An Inupiat Eskimo born in the village of White Mountain, John served more than thirty years with the National Weather Service, most of them in Nome. He retired in 1990, but weather remains his active hobby, and he is known as the region’s top expert on the subject. John’s no stranger to KNOM listeners. He’s appeared on the air periodically discussing arctic weather phenomena. This, however, is the first time that we’ve convinced him to host a series of spots. And they are fascinating! DINING WITH ROYALTY: June 13th, KNOM news director Paul Korchin was at the Ronald Reagan Center in Washington, DC, attending the National Association of Broadcasters’ “Service to America Summit” reception and dinner. NAB holds the fancy black-tie event every year to honor local service rendered by radio and TV stations. Ric Schmidt attended the 2001 summit, and Tom Busch the 2003. KNOM’s top news reporter was in heady company. In addition to Paul and other individuals representing 2005 Crystal-honored stations, one guest this year was Her Majesty Queen Noor of Jordan. NAB paid all transportation and lodging expenses. GAG PHOTO: (left) Who did Paul Korchin happen to "bump into" in a baggage area of Washington's Reagan National Airport? 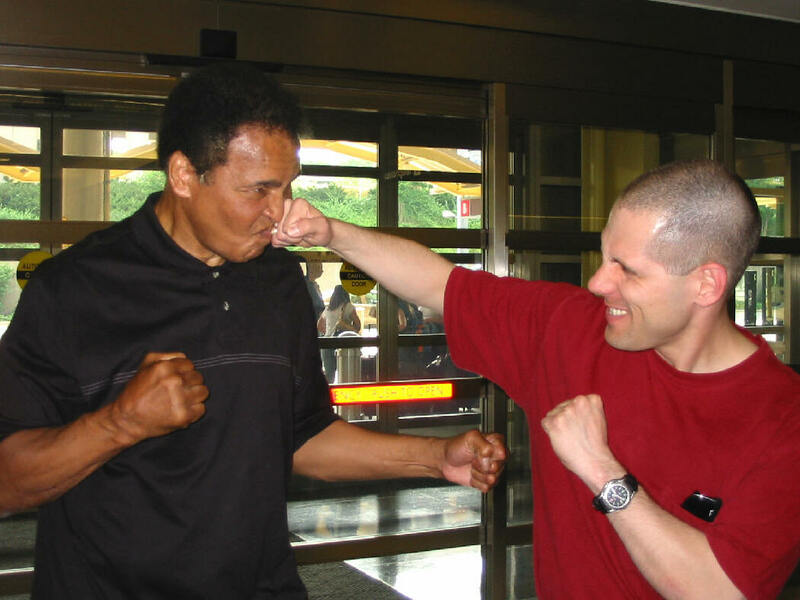 It was none other than Muhammad Ali, who insisted that they strike this pose when their picture was taken. KNOM is the oldest Catholic radio station in the United States, hard at work, thanks to you. INSPIRATIONAL SPOT: Keep this thought handy to help brighten your day: God is absolutely, without a doubt, head-over-heels in love with you. He sends you flowers every spring, and a sunrise every morning. He could live anywhere in the universe. But he chose your heart. INSPIRATIONAL SPOT: Nothing to be thankful for? Check your pulse! MORE POWER TO YOU: (left) KNOM public affairs director Amy Flaherty checks the mission’s new FM transmitter. On May 17th, the station’s power rose more than tenfold, to 1,000 Watts. While today’s equipment tends to be reliable and stable, KNOM’ers log five critical readings every few hours, to identify problems before they become serious. The transmitter is the light gray unit behind the clip board. It is fed by what’s called an “exciter,” which is located right above it. 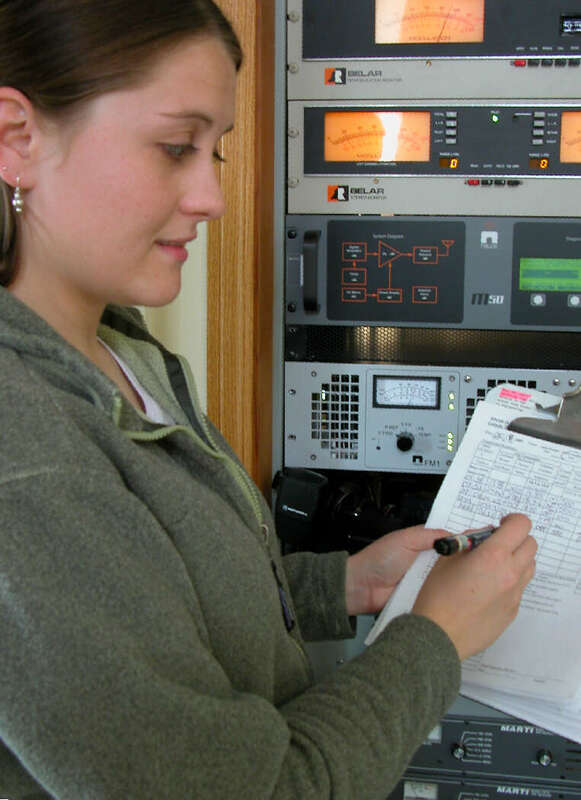 From Cottage Grove, MN, Amy produces news interviews and deejays the morning shift as well. In June, she celebrated her third anniversary with KNOM. She's a busy woman. In addition to her full-time work at the station, you’ll also find Amy helping out in the region’s juvenile correction facility. ON THE GO: Paul Korchin wasn’t the only KNOM’er on the road - many staff were not only on the air, they were in the air this month. Tom Busch was back in Nome twice, to install a replacement remote control for our AM transmitter and give the 25,000-Watt unit its annual checkup, and flew to Seattle to attend Augie Hiebert’s lifetime achievement Emmy Award presentation. "It was breathtaking," Tom says. "Augie has trouble walking, and it took him more than two minutes to step up onto the stage. The crowd gave him an enthusiastic standing ovation the entire time." Meanwhile, volunteer Katie Ringenbach was in the village of Koyuk to cover a clinic opening, and in Savoonga, to report on construction there. For director of programming Kelly Brabec, it was a flight to Anchorage for a few days. Kelly is volunteer Nome-area head coach for the Special Olympics. Kelly smiles when she tells folks that the young athlete in her charge won four medals! Thanks to everyone who stayed at home to keep things running smoothly. AT WILL: Please consider adding missions like KNOM to your will. We prayerfully place all bequests into funds that are used only for future major improvements and for emergencies. Your gift can support this mission many years into the future. INSPIRATIONAL SPOT: Worry is a thin stream of fear trickling through the mind. If we add more worry, it can cut a deep channel through which all our other thoughts drain. Let your stream of worry trickle out of your mind ¾ to God. INSPIRATIONAL SPOT: Time on your knees will improve your standing. IMAGES: (left) From Florence, Alabama, KNOM volunteer Clinton White is a busy man. Music director for the station, he also hosts the late afternoon program and produces the last newscast of the evening. 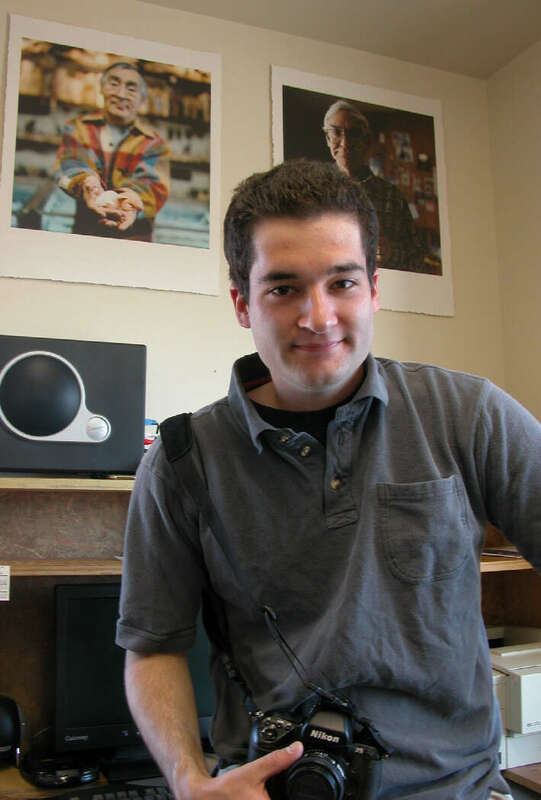 In his spare time, Clinton is an avid and talented photographer - he taught a course on the subject at Nome’s community college last fall - and he enjoys graphic design. Over the past year, he produced a volunteer recruitment poster for KNOM, as well as posters promoting healthy choices, wellness and traditional native values for Nome’s hospital and the Eskimo Walrus Commission. At the end of Clinton’s second volunteer year, he leaves KNOM this month. He will remain in Nome, for at least a year, however, and after that, he intends to pursue a master’s degree in business. Clinton, thank you for two excellent years! (Left) Here’s a photo which Clinton White took during a KNOM trip to Little Diomede Island this spring. The Alaskan village, in which almost everyone is a KNOM listener, appears on the right. To the left, only two miles of frozen ocean away but across the International Date Line, sits Big Diomede Island, which is Russian soil. A CHILLING SIGHT: The afternoon of June 13th, Tom Busch was driving to the remote KNOM transmitter when he witnessed something most unusual: Three children wading in the Bering Sea, up to their waists. INSPIRATIONAL SPOT: Remember the three R’s: Respect for yourself, regard for others and responsibility for all of your actions. JUST DUCKY: (left) When a fuel company wants to simulate an oil spill, they call on KNOM general manager Ric Schmidt. 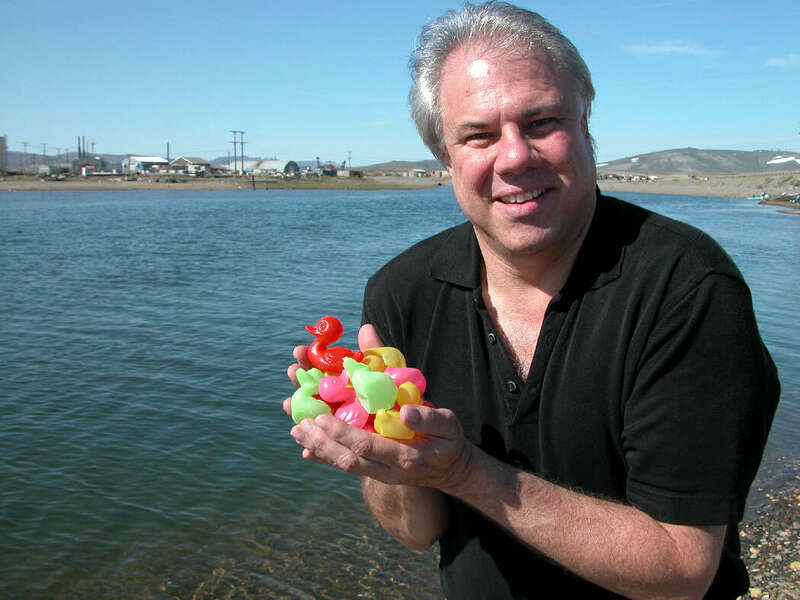 Ric stores thousands of plastic ducks in the KNOM shed for Nome’s Rotary Club, which floats the numbered toys down Nome’s Snake River on Labor Day as a fundraiser. The firm borrowed a hundred ducks like these, and set them into the river to replicate a spill during their exercise. THE COUNT: KNOM has aired about 17,000 inspirational spots so far this year, and an equal number of educational ones, thanks to you. HOSTING: The Midnight Sun Folk Fest is part of Nome’s summer solstice celebration. It’s a day-long free concert by about a dozen local musicians and combos and a guest group or two. This year, the Nome Arts Council tapped two emcees who are no strangers to microphones, KNOM public affairs director Amy Flaherty and volunteer news reporter Katie Ringenbach. NEW DIGS: A construction crew excavating near Nome’s port accidentally uncovered what might be a significant archaeological find. According to KNOM newscasts, they found the remains of a prehistoric house, including about twenty pottery shards, an ivory wedge, an antler point and a drilled caribou rib. The house could be as young as 400 years old - or as old as 4,000. WE HAVE ISSUES: This past month, topics discussed on KNOM included native education, high village teacher turnover, dental health, theater arts, music, arctic pollution and regional history, among many, many others. Thank you for making the discussion of important western Alaska issues possible. We begin each staff meeting with a prayer for your intentions, and we keep you in our personal prayers, too. We could not perform this work without you.